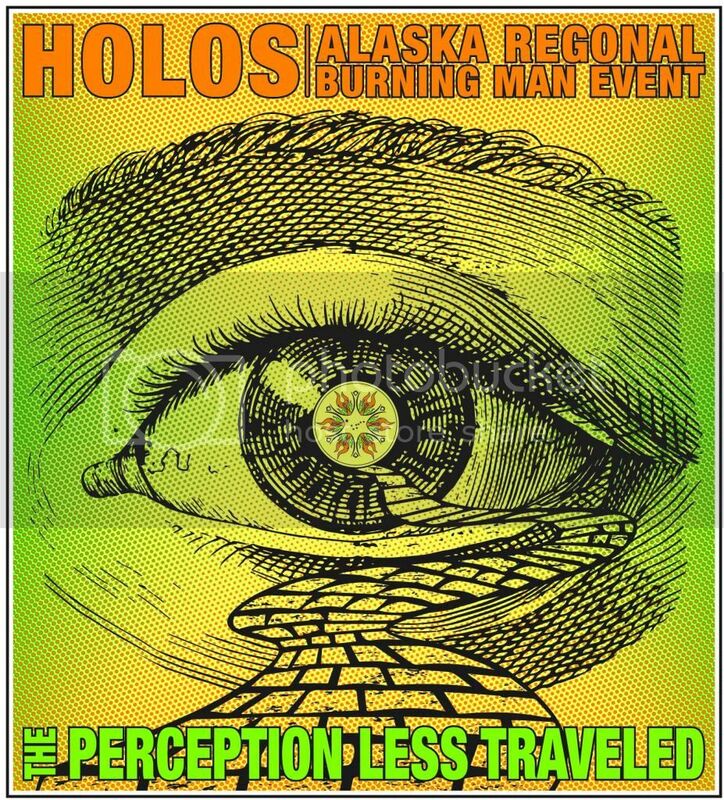 Holos 2014: “The Perception Less Traveled” June 13-15. Tickets on sale! Presale tickets: $20. Tickets $30 at the event gate. Tickets now available at Planet X in Spenard, Alaska and Mammoth Music in Downtown Anchorage. You must be at least 18 years or older to purchase tickets (19 years to enter Planet X). Anyone younger than this that is planning to attend the event must be accompanied by a parent or legal guardian. I understand that this isn’t very radically inclusive, but insurance companies have standards. On top of our financial aid, a former regional representative of Burning Man has offered a “Regional Representative Art Scholarship” of $100 to go to the project of her choosing. This scholarship shall be paid out after all projects registered for financial aid have been distributed their assistance. Please email us for more info. A date has been selected for Holos 2014. June 13-15th. We are currently accepting applications for art/camp project registration and financial assistance. Application deadline: May 11. Head to our Facebook page for more info on how you might apply. Pre-sales will end sometime this Thursday. Think ahead and buy your ticket now or be prepared to pay at the gate! 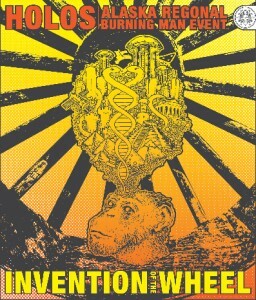 Holos 2013: “Invention of the Wheel” June 14-16. Tickets available! Tickets are now available for Holos 2013. 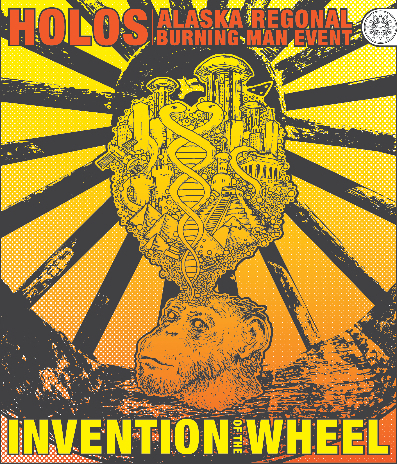 The theme this year is “Invention of the Wheel.” Spanning throughout human history, there have been inventions and reinventions that have caused significant change in human society. Tickets can be purchased at Planet X in Spenard, Anchorage and Planet X in Muldoon. Tickets also available at The Natural Canvas. $20 presale and $30 at the gate. A date has been selected for Holos 2013. June 14-16th. We are currently accepting applications for art/camp project registration and financial assistance. Application deadline: May 11. Head to our Facebook page for more info on how you might apply. The wrap-up report for the 2012 event has been posted in the Wrap Up section of the site. Check back soon for new additions to the Gallery section! We have now entered the week of! It will be awesome to see everyone out there. I’ve had several groups approach me with some really cool theme camp ideas. I’m looking forward to experiencing all they have to offer. Please remember this is a Leave No Trace, Pack it in, Pack it out event. Trashcans will not be available for you, you will need to take care of your own trash. Presale tickets for Holos 2012 are now available for $20 at Plantet X in Spenard and Muldoon. Other locations soon to come. If you hurry to the Spenard store you can get ticket #1! We’ve recieved the official go-ahead from Burning Man headquarters to throw another Burning Man regional event here in Alaska! Flyers have been ordered and will be out this friday, so keep a lookout for them. Pricing will be the same as last time. $20 presale and $30 at the gate. Tickets availible soon.